The critical role of standards for smart grid has already been realized by world-wide governments and industrial organizations. There are hundreds of standards for Smart Grid which have been developed in parallel by different organizations. It is therefore necessary to arrange those standards in such a way that it is easier for readers to easily understand and select a particular standard according to their requirements without going into the depth of each standard, which often spans from hundreds to thousands of pages. The book will allow people in the smart grid areas and in the related industries to easily understand the fundamental standards of smart grid, and quickly find the building-block standards they need from hundreds of standards for implementing a smart grid system. 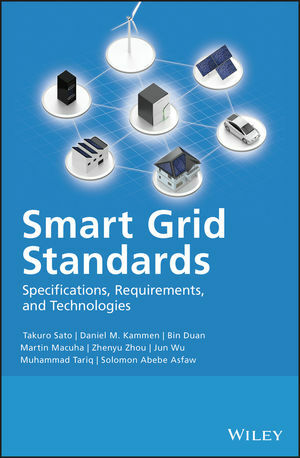 The authors highlight the most advanced works and efforts now under way to realize an integrated and interoperable smart grid, such as the “NIST Framework and Roadmap for Smart Grid Interoperability Standards Release 2.0”, the” IEC Smart Grid Standardization Roadmap”, the ISO/IEC’s “Smart Grid Standards for Residential Customers”, the ZigBee/HomePlug’s “Smart Energy Profile Specification 2.0”, IEEE’s P2030 “Draft Guide for Smart Grid Interoperability of Energy Technology and Information Technology Operation with the Electric Power System (EPS), and End-Use Applications and Loads”, and the latest joint research project results between the world’s two largest economies, US and China. The book enables readers to fully understand the latest achievements and ongoing technical works of smart grid standards, and assist industry utilities, vendors, academia, regulators, and other smart grid stakeholders in future decision making. The book begins with an overview of the smart grid, and introduces the opportunities in both developed and developing countries. It then examines the standards for power grid domain of the smart grid, including standards for blackout prevention and energy management, smart transmission, advanced distribution management and automation, smart substation automation, and condition monitoring. Communication and security standards as a whole are the backbone of smart grid and their standards, including those for wired and wireless communications, are then assessed. Finally the authors consider the standards and on-going work and efforts for interoperability and integration between different standards and networks, including the latest joint research effort between the world’s two largest economies, US and China. The book is written in an accessible style, ideal as an introduction to the topic, yet contains sufficient detail and research to appeal to the more advanced and specialist reader.